Boil noodles to al dente in salted water. Set aside. Melt butter in a saucepan until hot, then add the flour and cook, whisking, until light blonde in color. Add cream to roux and whisk to combine, then add Cheddar and Monterey Jack cheeses. Add garlic powder and onion powder. Mix sauce with macaroni and add salt and pepper. Add 2 tablespoons macaroni to a egg roll wrapper Tuck in each side, then roll up, sealing shut with some egg wash.
Heat several inches of oil in a Dutch oven until it registers 350 degrees F on a deep-frying thermometer. Fry the egg rolls in batches, turning occasionally to brown evenly, until golden brown and crispy, 4 to 5 minutes. Place egg rolls on paper towels and sprinkle with salt, pepper and smoked paprika. 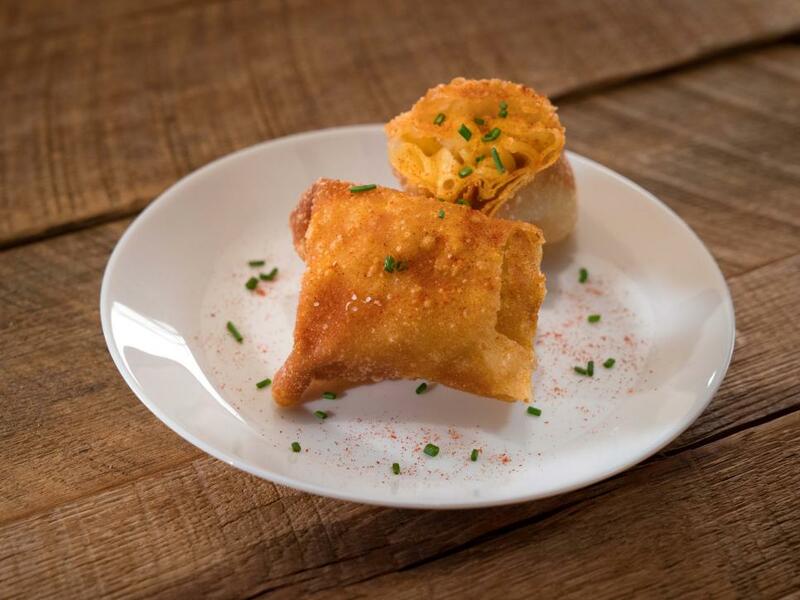 Cut egg rolls in half and garnish with chives and additional smoked paprika.